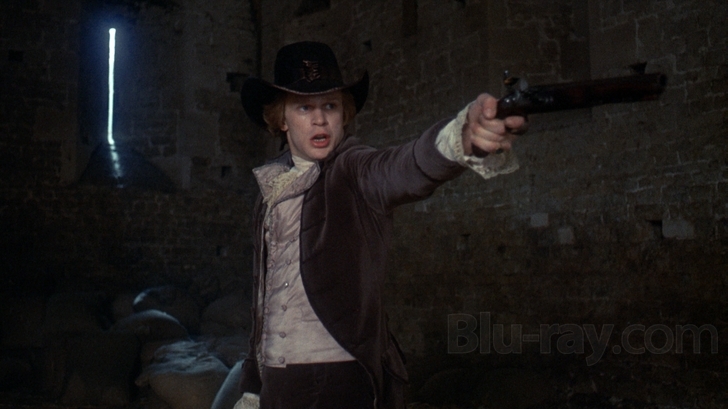 Ever since Stanley Kubrick’s BARRY LYNDON found its way to Blu-ray disc in what has to be the best this film has ever looked since its initial projection in 35mm, there has been wild debate as to the proper aspect ratio of LYNDON as per Kubrick’s intent. It appears that this debate is endless and with Kubrick no longer with us, even his own scribblings seem to contradict his words and therefore leave us to trust or guess. 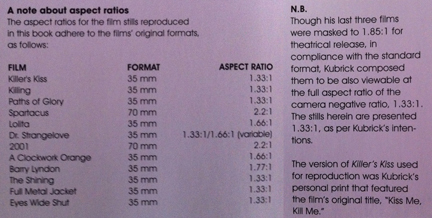 Some insist the film was designed and preferred by Kubrick in the 1.66:1 ratio. However, many theaters, particularly here in the states, were simply not equipped for screening 1.66:1. The one thing everyone seems to be able to agree on is that Kubrick did NOT want the film to be projected at the standard American flat ratio of 1.85:1. There are many, including Kubrick’s long-time friend and personal assistant, Leon Vitali (who starred in BARRY LYNDON), who insist Kubrick’s preferred ratio for the film was 1.77:1. 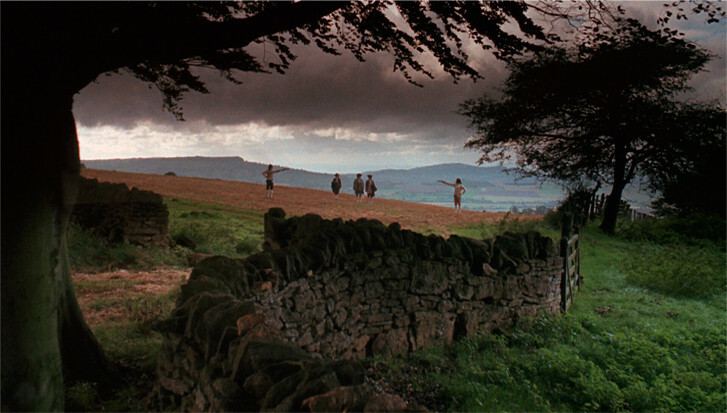 “There has been discussion that Barry Lyndon was composed for projection at 1.66:1, and this is an interesting thought. The problem, even in 1975, would have been that few cinemas were equipped to project that aspect ratio unless specially set up. In a very general sense, much of the world was running spherical at 1.75:1, while here in the colonies we were running at 1.85:1. 1.66:1 was a specific setup for revival theatres equipped with the necessary aperture plates, optics and maskings. “Thanks for this. Hopefully (though I’m sure, probably not) I can explain fully the situation as to the origin of the confusion. I can also tell you what Stanley explained to me and under what circumstances. I will try to make everything as clear as possible so excuse what may seem like a perfunctory layout in my response. 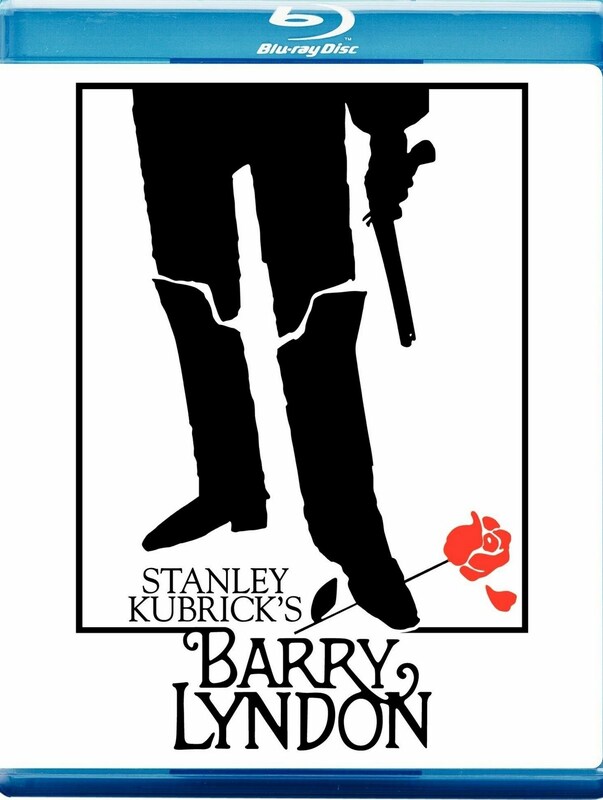 “(1) When we were shooting Barry Lyndon, Stanley saw that I was not only working hard as an actor, but saw that I was interestedin the technical process too. He invited me to be on the set even when I wasn’t called as an actor for shooting. An ‘invite’ was not a common occurrence from this particular filmmaker. “(2) He told me how he was inspired for some set-ups by pictures painted or drawn during the 18th century, particularly Hogarth‘s work. “(3) He also explained to me that even though I probably wouldn’t be aware of how to frame a picture, he said he thought that as an actor, I would only be interested in being in the picture, never mind how they were ‘framed’. “(4) He introduced me into the world of aspect ratios and what they meant; not only that but how important they were to him as a part, not everything but an important part nonetheless, of how they help in an overall impression of what appeared in the screen. “(6) He took me into his caravan and showed me how aspect ratios were worked out and, Stanley being Stanley, gave me a potted history of various developments in the history of picture making to illustrate his view. “For my continued part of this story, skip forward to 1977. “(8) I was living in Stockholm and still in touch with Stanley. “(9) Barry Lyndon was about to be released there along with other parts of Europe a year late because of a producers’ strike regarding profit-sharing in their projects. “(10) He asked me to go to the cinema there where the film was opening to check the print and because I knew little about everything involved in what a ‘perfect print’ should look like, Stanley told me to write everything down that I thought MIGHT look wrong to me. “(11) I did, and one of the problems I reported was that the top of the wide shots of ‘Castle Hackton’ — the portrayed ancestral home of Lady Lyndon — were cut off, some not so much but some seriously. “(12) Stanley said to me ‘That means they’re not thinking of screening it at 1.77 — you know what I’m talking about, Leon?’. “(13) He also said it had been a problem almost everywhere the picture had been shown. “(14) I went back to the theatre after having spoken to the very obliging people at Warners and we tried to see what could be done. They even had the screen taken down and then re-hung along with re-racking the picture from the projector in an attempt to rectify the problem. “(15) In the end, Stanley sent his editor, Ray Lovejoy, over to view the print and deal with the problem; Stanley only telling me that in the end, Ray had changed out some reels and on going back on the opening night, I saw that whatever he’d done had worked. “(16) Skip forward again to when I was a permanent assistant to Stanley and I was dealing with the labs. “(17) Whenever we were dealing with Barry Lyndon and I was projecting it for him, the first question out of his mouth was ‘Did you put the 1.77 aperture plate in, Leon?’ Like much else we did, it became a bit of a mantra. “(18) Whatever work we were doing with Barry Lyndon, he always, always talked of it’s correct aperture as being 1:1.77. He never mentioned any other aperture to me ever when we worked with the title and that includes all other formats. “(19) With all due respect to the doubters, many of them ‘doubters’ because they do actually care, I know, when one has heard for three decades that resonant Bronx accent saying 1:1.77 in relation to Barry Lyndon one doesn’t forget it, nor the circumstances surrounding the words. 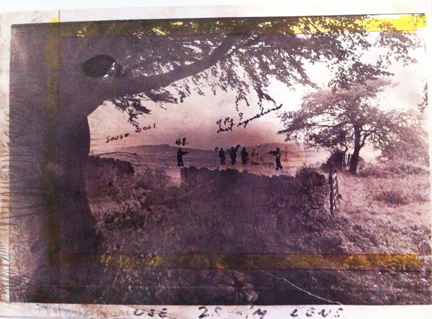 “(20) Now THE LETTER which I have received and possibly from Stanley. I can say with 99.9% certainty that it is genuine. “(21) He often enclosed a letter like this on first release in key cities everywhere not only with this film (I wasn’t with Stanley when Barry Lyndon was shipped out, but I was there for the whole shipping operation for Full Metal Jacket, in fact, I supervised most of it personally and physically) in an attempt to have the film seen universally in the way he in tended it when he was shooting. “(22) What has to be realised is this: 1:1.77 was not your common-or-garden aspect ratio. It may have been that some cinemas were unable or unwilling to have a special 1:1.77 aspect ratio’ plate made or even look for one. 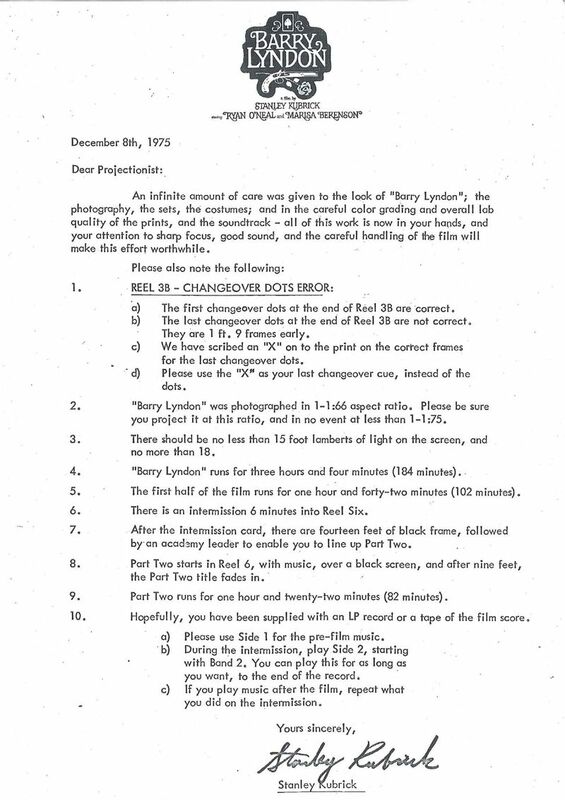 “(24) [This Plan B option/approach] would have been to avoid, at all costs, showing it theatrically in 1:1.85, an aspect ratio that does not suit this picture anymore than it suits Clockwork Orange which many theatres these days can only show it in as they no longer have the choice of screening even in 1:1.66. I know this because like The Battle of Barry Lyndon, I have fought The Battle of Clockwork Orange and The Battle of Dr. Strangeloveover the years too — both when Stanley was alive and since. And I can add that even when forced to shoot in 1:1.85, Stanley loathed the format because it wastes so much useable screen area. “I’m sorry for the length of the explanation. I have tried to be succinct but as with everything concerning Stanley, nothing is ever that simple to explain. “I suppose that whenever I have been asked the question, as recently during the New York and LA press junkets for the release of the 40th Anniversary Bluray of A Clockwork Orange, I SHOULD HAVE SAID that Stanley COMPOSED his pictures for Barry Lyndon in the Aspect Ratio of 1:1.77 and WANTED it screened that way’. “Maybe that would have taken some of the controversy out of it. So my abject apologies if I have inadvertently contributed to the controversy. “But I would urge everybody to look at the film, relax into its atmosphere, watch the outstanding performance by Ryan O’Neal (who was in almost every single scene and with whom Stanley was ‘well pleased’) along with the cream of the English acting profession, many of whom were all idols of mine at the time — Andre Morel, Marie Keen, Murray Melvin as the Reverend Runt, Frank Middlemass as Sir Charles Lyndon, Stephen Berkoff as the effeminate Lord Ludd and many other actors who in the final cut had very little of their performances left and then realized that it is probably the most wonderfully accurate portrayal of 18th century England, its mores and it’s social structure (and how not to succeed in social climbing) they’ve ever seen on the film screen. And truth be told, there’s no way to know what Kubrick would have chosen to do with LYNDON on Blu-ray. 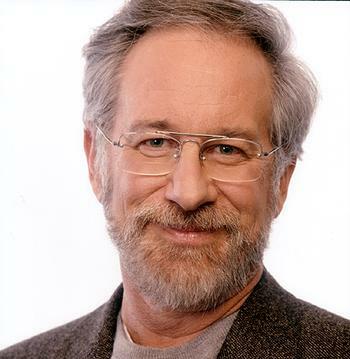 We know he wasn’t a fan of letterboxing and started making his last few films full-frame-safe for life on video. However, with 16:9 TVs now in most homes and Blu-ray being 16:9 native, Kubrick may have chosen to release the film to fill the frame. Especially since he clearly composed it knowing it would be shown at different ratios depending on where it was being screened. My gut tells me 1.66:1 would have been his personal favorite, but that doesn’t mean it’s the ratio he would have chosen for Blu-ray. We’ll never know. So while contradictions abound and the controversy continues, the film nevertheless looks stunning on Blu-ray and remains as timeless as ever. Perfection in cinema. Whether at 1.66:1 or 1.78:1, I couldn’t love it more. 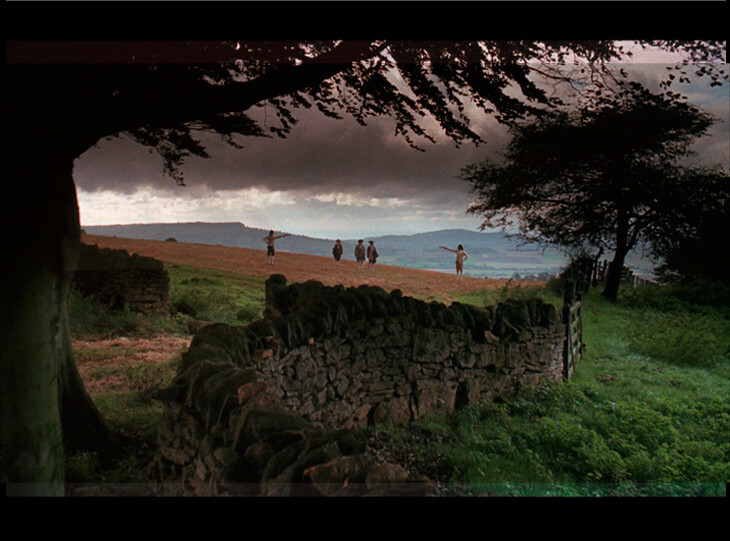 I’ll leave you now with four frames, the first a scaled-down image from the Blu-ray at 1.78:1, the second an image from the DVD release at 1.66:1, the third an overlay of the two (Blu-ray on top), and the fourth Kubrick’s own markings on the original location photo that suggest the idea of a safe area of 1.66:1 through 1.75:1 (or possibly 1.77:1). Clearly, the 1.66:1 shows more image, but whether or not it’s the best framing for the film will have to come down to a matter of taste. I fully support a director’s initial intent. However, that intent remains in question. And probably will for all time.